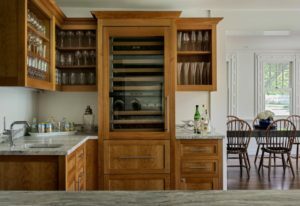 If you entertain frequently at home, a built-in wet bar—that is, some combination of storage and display cabinetry for glasses, silverware, wine, liquor, and mixers; counter top space where drinks and finger foods can be prepared and served; a sink and faucet; and maybe a small fridge or wine cooler—is an amenity worth its weight in gold. By using handsome hardwood millwork, you can turn what’s often a mundane service space into the life of the party. Here are three wet bars that do just that. As part of the renovation of a 19th-century house in Bridgeport, CT, Crisp Architects installed this splendid wet bar in a kitchen corner next to the dining room. The gorgeous woodwork is cherry finished with a hand-brushed clear stain, and the countertop, which matches that on the kitchen island in the foreground, is a quartzite called Fantasy Brown with a leather finish. Even though the ceiling slopes, a single cabinet height is maintained here and throughout the kitchen, creating a sense of unity that cabinets of different heights would spoil. Renovating a Wyckoff, NJ, brick colonial house, J.K Interior Living tucked this crisply tailored wet bar into an 8-foot-long passageway between the kitchen and living area. 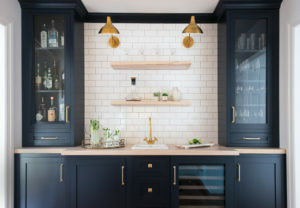 The poplar cabinets are painted Hale Navy, a rich shade of blue from Benjamin Moore; the counter top and shelves are beech with a clear finish that allows the sapwood’s pale-pink coloration to show, contrasting perfectly with the dark paint and the white subway tile backsplash. The polished brass sconces, faucet, and hardware and the sparking stemware in the glass-fronted cabinets complete the picture. 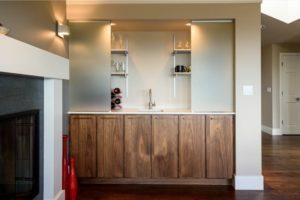 Nip Tuck Remodeling installed this sleekly modern wet bar as part of the expansion of the kitchen and dining areas in a Kirkland, WA, house. The elegant simplicity of the Scandinavian-style cabinetry allows the natural beauty of the medium-stained black cherry to shine out—even more so when the frosted-glass sliding doors are closed, turning the unit into a fine piece of built-in furniture topped with a lanternlike box of light. Stemware is stored on open wall shelving while a small undercounter refrigerator is concealed behind a cabinet door.